We live half an hour’s drive away from the coast in every direction. This evening we chose Poole Harbour for drinks and dinner. Poole harbour is lined with quaint old crooked buildings, easy to imagine the smugglers and sailors of old drinking and brawling in the doorways. …easy to imagine the smugglers and sailors of old drinking and brawling in the doorways. 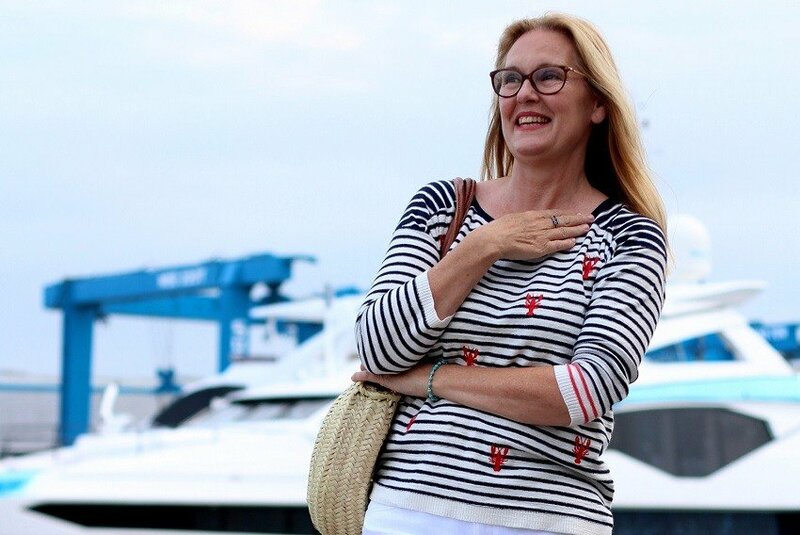 Oh so nautical, in keeping with the surroundings dont you think? 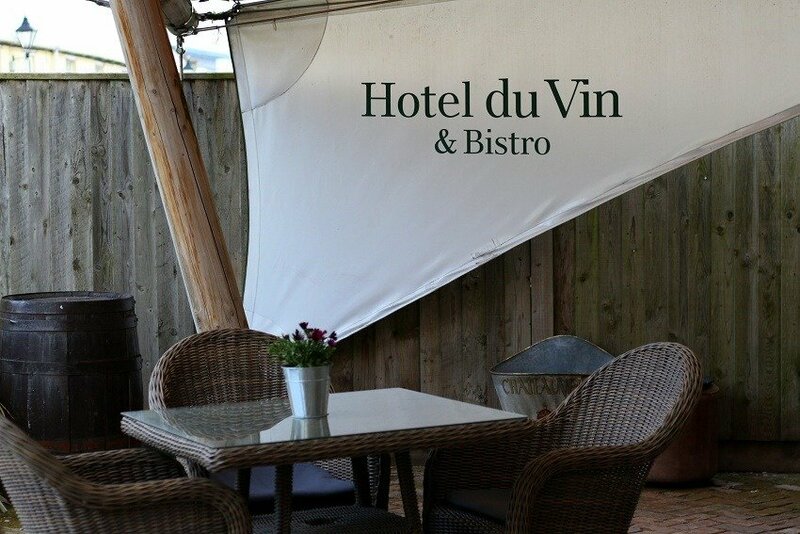 …Originally built in 1776, as the ‘Mansion House’, we’ve lovingly refurbished the hotel to reflect its nautical past, keeping original decorative features, whilst adding typical Hotel du Vin panache. Original stone stairs and classical columns greet you, with flickering ship’s lanterns lighting the way. 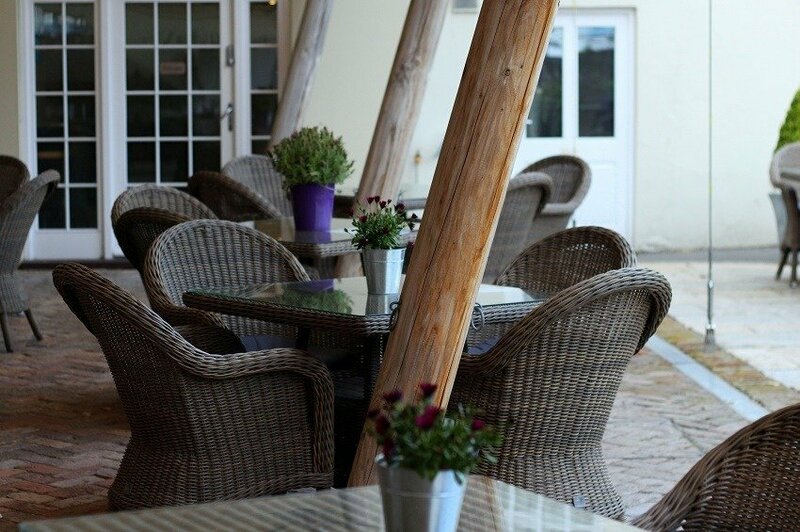 The courtyard’s sail-like awning invites you to dine under the stars. The comfy sofas and low beams of the Snug welcome you for an aperitif, cocktail, or nightcap. 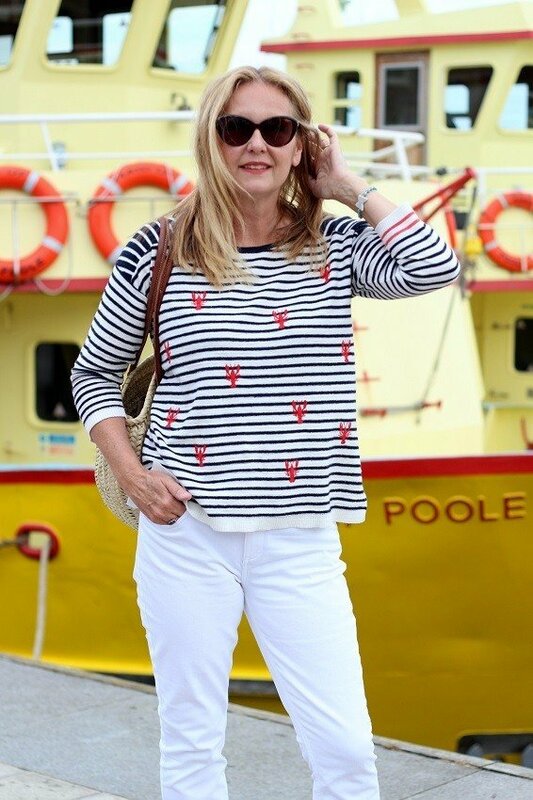 I chose to wear my new White Stuff white straight cropped jeans, a striped knitwear top embroidered with lobsters. Plus some grey canvas pointed slip on shoes. 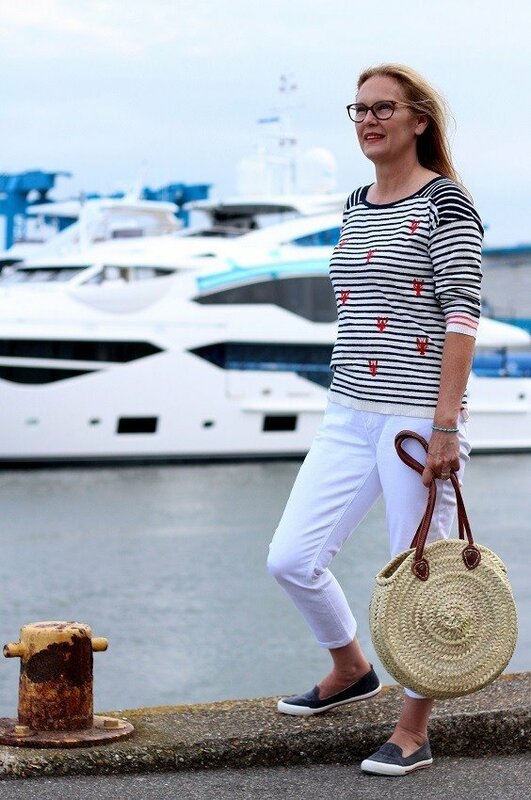 Very nautical and in keeping with the surroundings don’t you think? 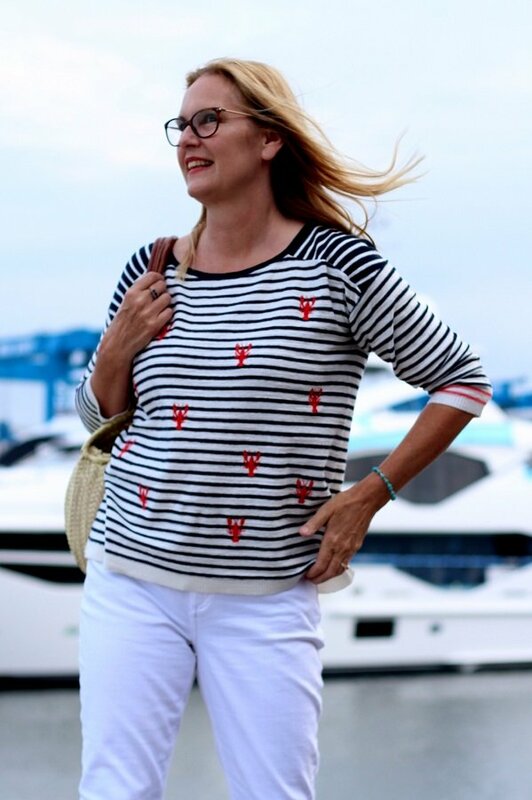 Never too old to wear lobsters? 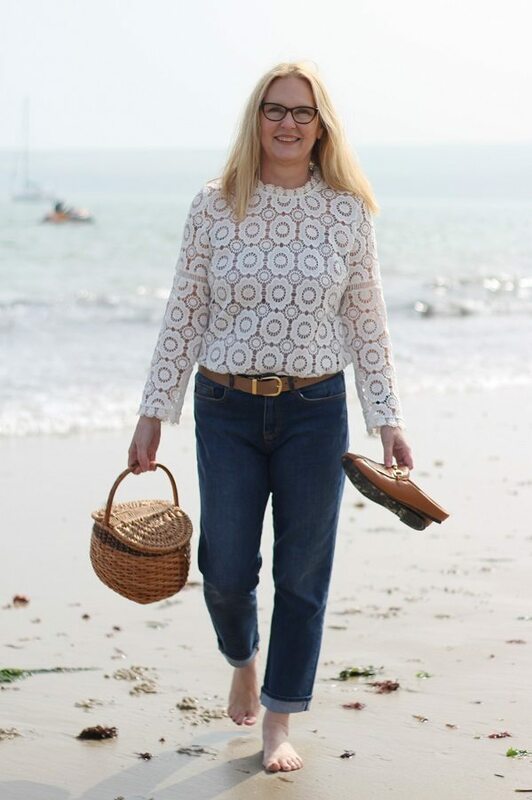 The jeans are mid rise and very comfy, the top has linen in it so keeps you cool and warm when needed and the shoes are pointed but comfy… win win win…! Did you see my post about my jeans made from recycled plastic bottles? Dont forget to sign up below to receive my post via your inbox? Outfit gifted by White stuff a British Company I am proud to work with! Love this cute look! 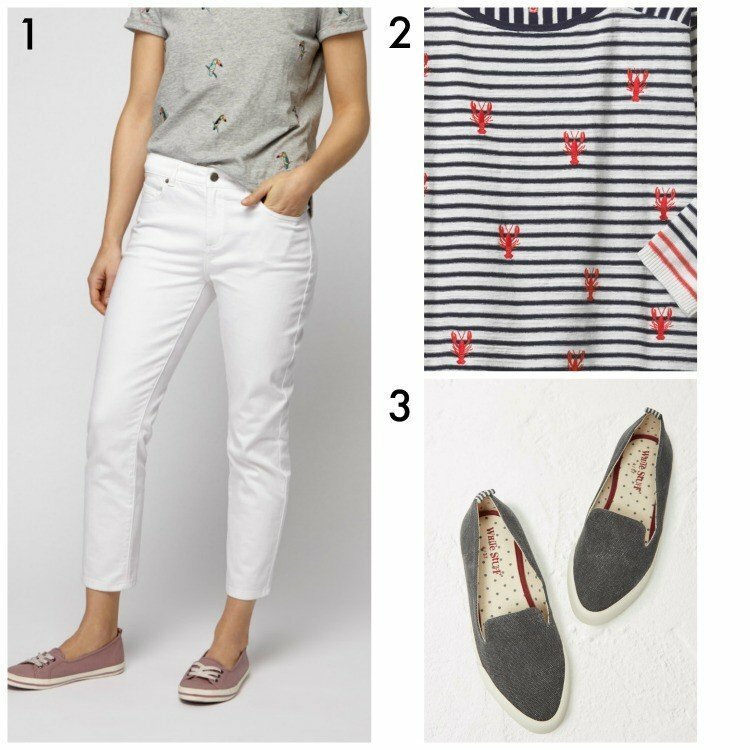 That tee is adorable and looks perfect with your white pants and sneakers. Your straw bag is amazing. Thanks for linking up with Fabulous Friday! Thank you Jennie! 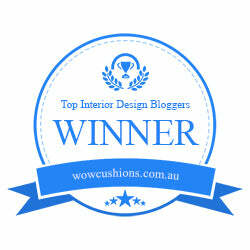 and you are very welcome I like your blog and your link up! Great idea picking dinner out! Love the outfit and Love that round straw bag! Lucky you living so close to the coast. Dont forget England is so small you are never very far from the sea! 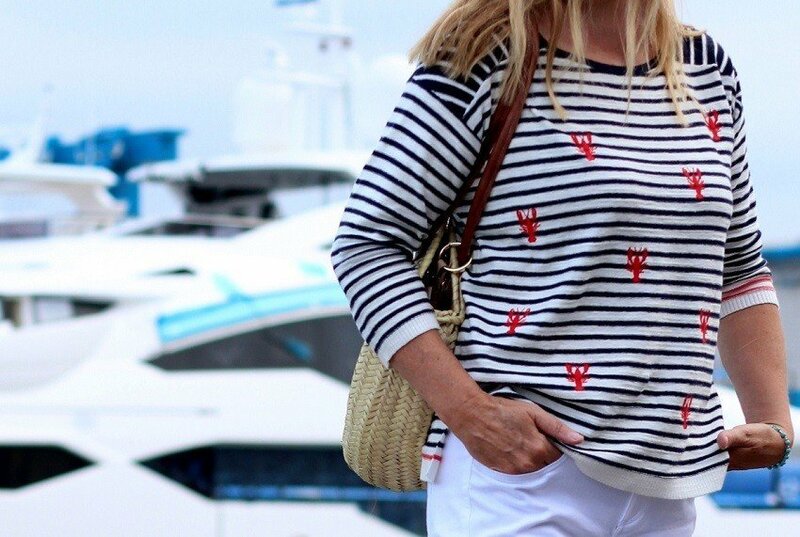 How adorable is that lobster embroidered sweater. Supersweet with the crisp denim jeans in white. I certainly would have chosen as you did p, and opted for a lovely dinner out. Looks like you had a fabulous time. 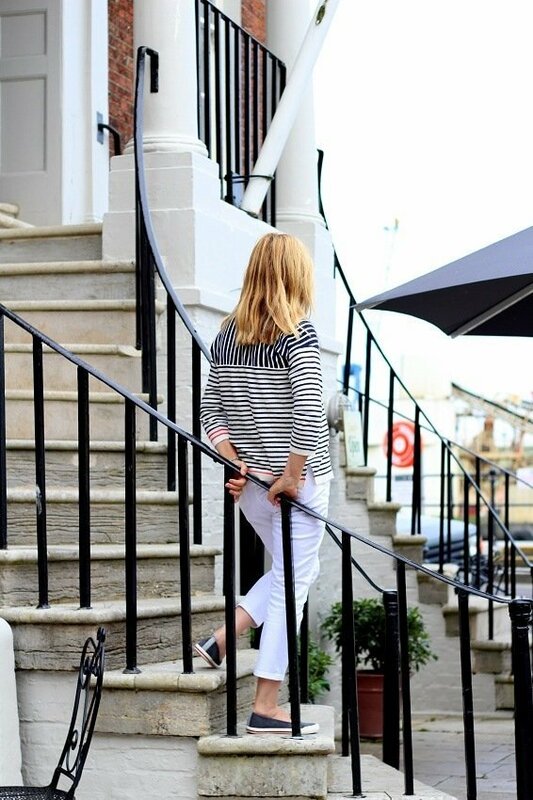 Hello Elle, so pleased you like my top it is lots of fun and perfect for a uk summer evening! Nooo what a coincidence, the harbour is lovely! Poole pottery is very collectable, some of the older stuff is gorgeous. My stepdad used to work for them too! Haha & thank you Maria! So glad you understand about the lobsters, do you wear them too? He is doing so well at his photography he is a very fast learner! thank you very much, I will pass on your comment to the photographer, he will like that. Poole Harbour is the only place I've ever visited in your part of the world and I loved it. That's just down from Sandbanks, right? I think I'm in the right place lol. But what a beautiful part of the world to live in. Seeing these photos really makes me miss England all the more. I miss the architecture, the history, the greenness!! Have a great day, Ashley! Next to Sandbanks and all very pretty down by the sea! I live in Dorset it’s a beautiful county. Come back and visit one day? 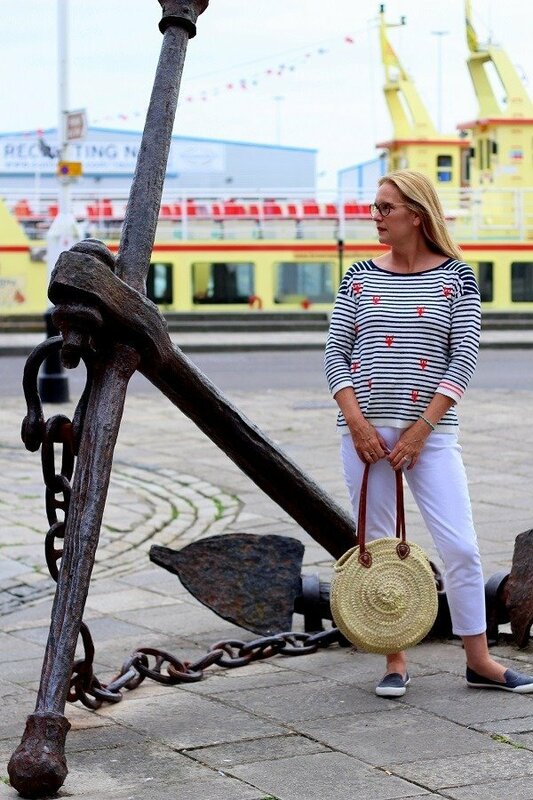 Great outfit for a day at the harbour! Thanks Nancy I was going for a nautical look, well spotted!